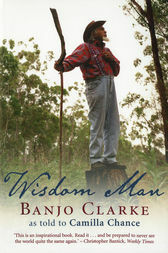 Some lives, like that of Banjo Clarke, are so special thy touch countless others without trying. A descendant of Truganini, Banjo was born in the early 1920s in the Framlingham Forest near Warrnambool, Victoria, a member of the Kirrae Whurrong tribe. By the time he passed away he was known and loved by thousands for his wisdom and kindness. He carried a swag during the Depression, fought with Jimmy Sharman's famous boxing troupe, built roads for the army in World War II, and has 67 great-grandchildren. Despite the great hardships he faced, Banjo was renowned for espousing love and forgiveness, sustained by his deep connection to his land, his ancient culture and its spiritual beliefs.